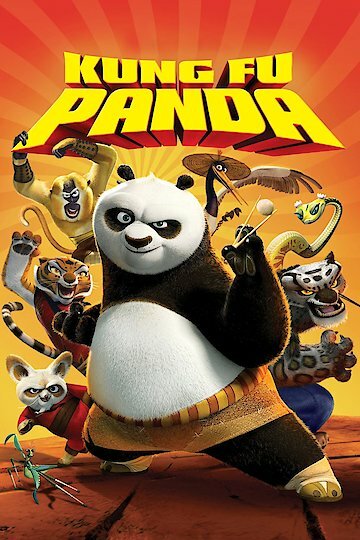 Launched in 2008, Kung Fu Panda is a computer animated comedy film. The production was handled by Dream Works Animation and allocated by Paramount Pictures. Kung Fu Panda features a star-studded cast including Angelina Jolie, Dustin Hoffman, David Cross, Jackie Chan, Seth Rogen, Lucy Liu, and Jack Black. The film hit a box office of $631 million. The story begins with a panda named Po, voiced by Jack Black, dreaming of himself as the Dragon Warrior. In Po's dream, he walks into a store to eat, but encounters trouble in the form of jackals. Po then unleashes his Kung Fu moves to vanquish the evil jackals and finds himself fighting with thousands more while skyrocketing into the air. He then finds the Furious 5, a group of Kung Fu masters each known for their own techniques, beside him. As they charge to battle, Po is then awoken from his slumber by his father, a goose named Ping. Together, Po and Ping run a noodle restaurant in a Chinese area called the Valley of Peace. Secretly, however, Po dreams of becoming a Kung Fu master someday, but is stuck working as a waiter for the restaurant. The story them turns to Shifu, the Furious Five's master, along with his master, an old turtle named Oogway. In a temple, Oogway slowly speaks about his vision about Tai Lung, an evil snow leopard, and his escape from prison to seek vengeance in the Valley of Peace. Tai Lung was imprisoned for his lust for power. When he was denied of the Dragon Scroll, which contains the secret to limitless power, Tai Lung enrages and attacks the city, forcing Oogway and Shifu to stop him and have him locked away for good. Upon such alarming news, Shifu sends his messenger to the prison facility guarded by rhinos. Shifu then holds a Kung Fu tournament for the Furious 5. After their exhibitions, Oogway will then pick one from the five to be the Dragon Warrior. Po arrives to the tournament with his noodle cart, exhausted from running up the long stairs that lead to the temple where the tournament was being held. But as Po approaches the entrance, the doors shut and he is unable to enter. He gets an idea to strap himself to a pack of rockets to catapult himself up the high walls. The plan works and Po gets inside the temple. But due to the impact, he gets dizzied and nearly fainted. As he opens his eyes, he sees Oogway pointing his finger at him, deeming that Po is the chosen Dragon Warrior. Po then gets trained by master Shifu to prepare him for his fight with Tai Lung, who managed to escape the well-guarded prison just as Oogway envisioned it. Kung Fu Panda is currently available to watch and stream, buy on demand at Amazon, Vudu, Google Play, YouTube VOD online. When Universal and Hasbro made a deal back in 2008 for a string of movie adaptations, the world had just one question: how the heck do you make Candyland into a full-length feature film? We'll find out soon, as writers Jonathan Aibel and Glenn Berger are set to write the screenplay themselves. The team brought us the script for "Kung Fu Panda" and is penning the sequel, "Kung Fu Panda 2: The Kaboom of Doom," as well.